In the matter of Calvin & McTier  FamCAFC 125 (12 July 2017), the Full Court heard an appeal by a husband who argued that an inheritance received FOUR years after separation should not be included in the property to be divided. The Full Court held that the property to be divided in a matrimonial matter is the property held by the parties at the date of HEARING, not date of SEPARATION. The husband’s counsel submitted a number of legal arguments to defeat the inclusion of the inheritance, including the proposition that if the inheritance was to be counted – the later acquired inheritance should be subject to a separate finding as to division (in that case, the inheritance equated 32% of the property pool, which the trial court awarded 65% to husband, and 35% to wife). The Full Court did not agree. The Full Court determined that a trial court has discretion to make decisions as to the whole of the assets of the parties, including assets acquired long after separation. To make matters worse, the husband was left to pay the parties’ costs. The lesson here is that if your beneficiaries are separated, but have not resolved matters by a binding financial agreement or court orders (far preferred because of the finality), then you should be revisiting your estate planning and contemplating proper testamentary trust structures with adequate appointor and guardian provisions. Also, if you have separated, but believe the cost of making a binding financial agreement and/or seeking court orders is “too hard” or “not worth the expense”, think again. It is far better to divide what is your marital pool, than risk dividing what is your later accumulated wealth. Whilst adjustments and contribution weighting may allow for a factor which compensates for your later accumulated wealth, you most likely will lose part of that accumulated wealth. Life is a gamble, sometimes you win the gamble. If you aren’t up for the gamble, we welcome you to contact one of the estate planning and/or family lawyers at Nautilus Law Group. Please free to contact Katrina Brown on (07) 5574 3560 or by email. 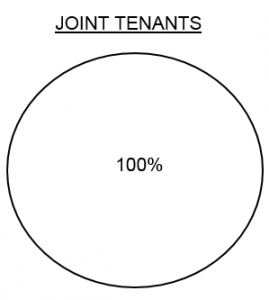 Joint Tenants or Tenants in Common – What’s the Difference? If you hold real property with another person, it is important to know whether you hold the property as joint tenants or as tenants in common. A joint tenancy is where two (or more) people (or legal entities) own an asset jointly – that is 100% of the asset is held in ALL names. No one owner has a fixed interest in the asset. This is commonly the situation between spouses. When one owner of the asset dies, their death is recorded and the asset automatically transfers into the name of the surviving owner. A “jointly held” asset does not (except in some instances in New South Wales) pass to your estate – it passes to the survivor automatically. Conversely, a tenancy in common is where two (or more) people (or legal entities) own an asset, but each person owns a specified share. This situation is common in business dealings and in dealings where parties wish to own distinct interests in an asset. 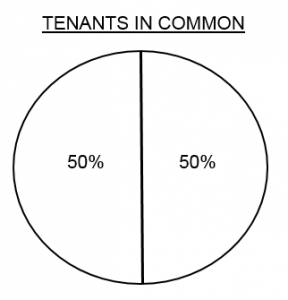 The below diagram shows a “tenancy in common” between a husband and wife, with the husband owning 50% of the asset, and the wife owning 50% of the asset. On the death of one of the spouses, their share passes to their estate and is distributed in accordance with their Will. The share does not pass automatically to the surviving spouse. There are benefits and downsides to each type of holding; accordingly, owners need to be aware of the consequences of each option – to ensure suitability. What happens if I want to change the way the asset is held? If you hold an asset as joint tenants, and wish to sever the tenancy, or if you hold the property as tenants in common in equal shares and want to become joint tenants, it is possible to change the way the property is held. These transactions are commonly effected for estate planning or family law purposes. This change is effected by way of a form signed by one or both property owners, which is then stamped and registered with the Titles Registry as a change of tenure transaction. In some circumstances, there is a transfer duty exemption which can apply. If you wish to discuss changing the tenure on your property, please contact Caitlin Bampton on 07 5574 3560 or via email. This question asks whether an employee is a related party of their employer (or the employer a related party of the employee’s SMSF) for purposes of Section 71 Superannuation Industry (Supervision) Act 1993 (SISA), in respect to the In-House Asset Test and Section 66 of the SISA, in respect to the prohibition against acquiring certain assets (including residential property) from a related party. There is no default rule that an employee is an associate of their employer. The analysis does not, however, end at that fact. A related party of another is defined at section 10(1) of the SISA as a member, a standard employer sponsor of the Fund, or a Part 8 Associate of either the member or the standard employer sponsor of the Fund. Assuming the employee’s SMSF is not an employer sponsored fund, the question is whether the employer may nonetheless be a Part 8 Associate of the employee. A Part 8 Associate is defined at section 70B of the SISA as a relative of an entity (if the employee is unrelated to the employer, no problem), a partner of the entity (if the employee is not a partner – then not a problem), a trustee of a trust for which the entity is “controlled” (if the employee has no influence over the trust, receives no income or capital, etc. – then not a problem), or if the employee has a “sufficient influence” or “majority voting interest” in the entity (this could be the area in which the test is relevant, because as an employee she may have significant influence over the conduct of the entity), or another Part 8 Associate of the employee has this influence (for example, a family member controls the employer or a related entity of the employer). In respect to the question of “sufficient influence”, we consider section 70E of the SISA, and note that it may be the case that the employee has considerable conduct in the employer’s affairs. For example, the employee may, for a property developer, determine the properties to be acquired and/or developed, and be charged with the derivation of investors and the profit sharing relationships. The employee may also, in such circumstances, receive a bonus on the development projects. The directors may rely on the employee to provide recommendations across the business. In this case, the employee may likely have “sufficient influence” to be a related entity to his employer. Similarly, if the employee received, as a consequence of employment, the right to demand an asset as compensation for the services to the employer, this may be “sufficient influence” to be a related party. On the other hand, if the employer is a property developer, and the employee is a secretary with float tasks over administration matters, it is quite likely the employee has little or no influence over her employer. The circumstances in which section 70E may apply in an employee/employer relationship are complicated and should be considered on the facts and circumstances (consider for example the relationship between employer and employee for purposes of the Fringe Benefits Tax Assessment Act 1986 (Cth)). Provided the employee is not a Part 8 Associate (nor a related party of the employee) to the employer, then the employee may acquire assets of the employer at arm’s length and commercial terms (subject to satisfying at all times section 62 of the SISA, being the Sole Purpose Test), without restriction under the test of section 66 (restricting acquisitions of assets from members and their related parties), and section 71 (In-House Asset Test) would not apply if the asset was acquired. Notwithstanding the above, any transaction must be compliant with section 109, with every stage of the acquisition, including any vendor finance arrangements, made on arm’s length and commercial terms. Whilst sections 67 and 67A do not prevent an employer from lending money to an employee (subject to any restrictions posed by Division 7A of the Income Tax Assessment Act 1997), the finance arrangements (limited recourse borrowing arrangements) must be such that the vendor (employer) does not retain title over the asset pending settlement of the borrowing. If you have any queries regarding the subject of this article, please do not hesitate to contact Katrina Brown via email or on 07 5574 3560.